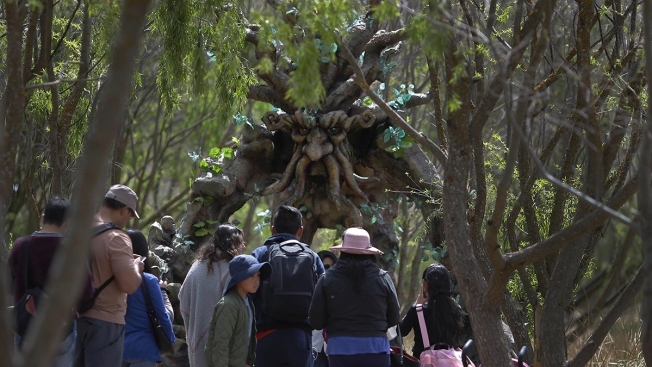 In this Aug. 4, 2018, file photo, a group of residents stands near a sculpture of an Ent character from the "Lord of the Rings" movies, at a public wetland in Cuzco, Peru. Roughly a thousand people now visit each week, mostly locals under age 30, officials say. The Huasao wetland in the heart of the bygone Incan Empire languished for years as a wasteland that locals used as their dump. Cleaned up and given a second life, it's now attracting droves of tourists lured by magical figures plucked straight from Hollywood movies. Towering statues of Ents — trees that walk and talk in the "Lord of the Rings" movies — and a smaller reproduction of Groot from the "Guardians of the Galaxy" series are set amid the woodsy landscape and glassy lagoons. They're drawing crowds eager to pose for selfies. Although it's a small area, environmentalists cite its recovery as part of a global battle to reverse the trend of filling or draining wetlands to make way for new farmland, industry and neighborhoods. 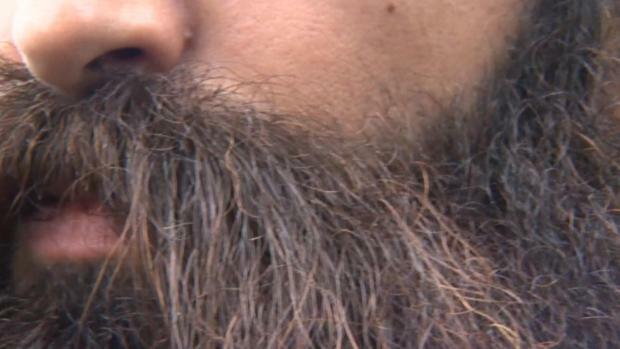 Experts say such developments have already devoured a third of the world's wetlands. Those behind the restoration say they included the eye-catching statues to target young people, while hoping to spark their appreciation of nature. "I thought it made sense to focus on children, to stir their enthusiasm for the environment," said Jeancarlo Pacheco, a Peruvian agronomist who led the recovery effort. The wetland covering 5.5 hectares (14 acres) sits a short drive from Cuzco, the historic capital of the Inca empire high in the Andes mountains. For decades, locals used the wetland to dispose of animal carcasses, construction waste and any kind of trash, including non-biodegradable plastic. A group of environmentalists recently set out to reclaim it. They won $1.3 million in backing from Peru's government and the Development Bank of Latin America. That covered the cleanup and construction of walkways, channels and an island surrounded by small lagoons that capture water streaming down the mountains. Next came the statues — five of them. Some of the tree-like figures tower 5 meters (16 feet) tall, with branch-like hands dramatically reaching out. A less menacing Groot, a pop culture icon from the Marvel movie, wears an inviting smile. It opened on May 1, and the next day got a surprise boost from afar when "Guardians of the Galaxy" director James Gunn tweeted photographs of the statues. Roughly a thousand people now visit each week, mostly locals under age 30, officials say. Jose Luis Venero, a Peruvian biologist and wetlands expert, said snapping selfies with the statues is fine, but he really wants visitors to walk away having learned the vital role wetlands play as habitat for birds and bees as well as cleaning water and preventing floods. Some 58 bird species build their nests at this wetland, including the yellow-crowned night heron, one of many that migrate from the southeastern United States. These herons have been spotted four times recently at the rejuvenated wetland. "Wetlands are the airports of migratory birds, where no one shows a passport upon landing," Venero said. "If we don't care for these wetlands, many of these migratory birds could go extinct."